Although clients disclose many of their concerns to therapists, they often choose to conceal some of their concerns as well. Equally, therapists occasionally reveal something of themselves to clients via therapist self-disclosure, but typically keep the focus on clients. Such disclosure, whether by clients or therapists, is seldom easy, and is instead often fraught with questions as to what, how much, and why to disclose, as well as concerns regarding the consequences of disclosure. Clearly, disclosure (or the lack thereof) is an important phenomenon of the therapy endeavour. 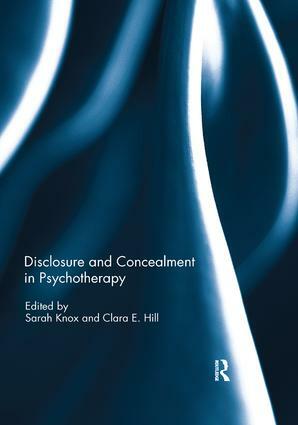 The chapters included in this book examine various aspects of the disclosure and concealment phenomena, whether from client or therapist perspective. Contributions examine the relationship of therapist self-disclosure to alliance and outcome; the phenomenon of therapist self-disclosure in psychodynamic therapy; client concealment and disclosure of secrets in therapy; young adults’ disclosures in psychotherapy and on Facebook; and lying in psychotherapy. Each offers intriguing insights into the disclosure, or lack of disclosure, in psychotherapy, from the therapist or client perspective. This book was originally published as a special issue of Counselling Psychology Quarterly.